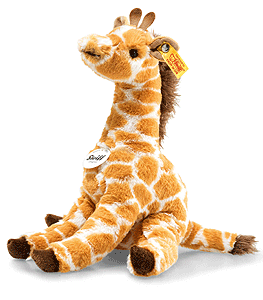 Gibsi Dangling Giraffe is hand made in the finest spotted cuddly soft plush. The 27 cm tall Gibsi dangling giraffe has a gorgeous printed giraffe pattern. Her feet and mane are brown. Her mouth and horns are shaded brown. Her nostrils are painted in. Her inner ears are coloured beige. Her tail has a bushy tip. A beautiful gift for any occasion.